Why should children have all the fun? Reading poems in bed – to oneself, to each other – is surely one of life’s great pleasures. 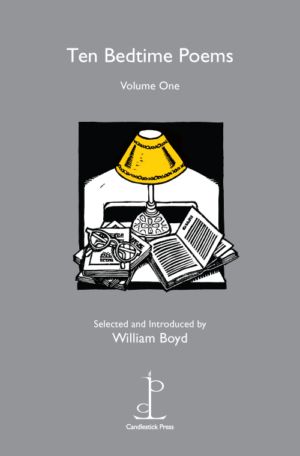 Ten Bedtime Poems (Volume One), selected by novelist William Boyd, belongs on your bedside table. As he writes in the Introduction, ‘novelists – serious novelists, that is, literary novelists – read a lot of poetry’ and his chosen poems make profoundly beautiful bedtime reading. William Boyd is the author of three collections of short stories and twelve novels, the most recent of which are Waiting for Sunrise and Solo, the latest James Bond novel.